This head turning hatchback is an Audi A1 Contrast Edition+, with a 2L diesel turbo engine which is in CO2 Band B, with 141 BHP and a combined MPG of 68.9. 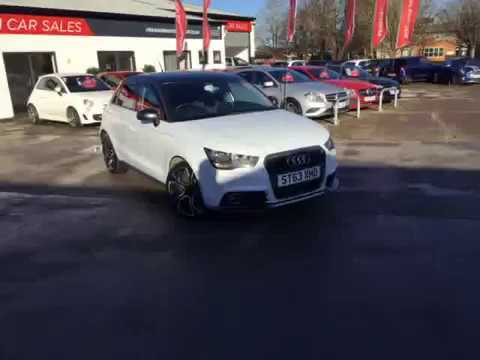 This A1 has covered just 52245 miles with an Audi dealership service history. Presented in Glacier White metallic paint with black and silver alloys, a contrast black roof line, Team Heko wind deflectors and a grey bumper, side skirt and boot lid trim. The interior of this hatchback has a great level of specification including Comfort Package giving you automatic lights and windscreen wipers, rear parking sensors and cruise control. Other specification includes Bluetooth connection, black cloth seat upholstery, white glossy interior trim and 6 speed manual transmission. Join us for a test drive at Evesham Car Sales, WR11 2FP. Before delivery this car will have undergone our extensive pre-delivery inspection covering all mechanical and cosmetic aspects of the car. All our cars come with a complimentary 3 month warranty which is extendable, fresh oil and filter change and a minimum of 6 months MOT and service if required. All our customers benefit from our Pershore Motor Group Reward’s Club which gives you FREE MOTs for life, 6 free wash and vacs by our professional team of valeters per year, £250 off your next car purchase with us at any of our showrooms and a £100 refer a friend bonus scheme. For all information regarding warranties with Pershore Car Sales or Pershore Sports and Prestige please contact us on 01386 570323. Welcome to Pershore Car Sales. To optimise your experience, cookie settings on the website are set to allow all cookies. By continuing your journey throughout the website, you consent to this. You can change these settings here. Financial Disclosure - Pershore Motor Group are a credit broker and not a lender. We are Authorised and Regulated by the Financial Conduct Authority. (FCA No 658422-3) Finance is Subject to status. Other offers may be available but cannot be used in conjunction with this offer. We work with a number of carefully selected credit providers who may be able to offer you finance for your purchase.